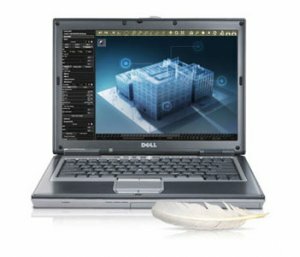 Dell Laptop Latitude D630 is a mainstream corporate notebook precedes the ever popular Dell Laptop Latitude D620 with the same wide-screen design and much of everything else. The unnoticeably difference is its newer Santa Rosa platform increasing its FSB up to 800MHz for more robust computing and consume less power, thus, longer battery life. Dell Laptop Latitude D630 packs in all the essentials needed to keep road warriors productive on the go with speedy Intel Core 2 Duo processor. Factor in the rich security options, the hard drive (with Dell's patented StrikeZone shock-absorption technology), solid battery life, and discrete NVIDIA graphics, and you have an excellent notebook for demanding business users. Weight/Dimensions: Approximately 5.0 lbs / 1.27" x 13.3" x 9.3"